Stink bugs have been found since the beginning of soybean production in United States. For most of this time, economic problems occurred mainly on soybean in the southern states, with only occasional concern in the southern portions of the Corn Belt. Because of warming temperatures, we are beginning to find more stink bugs now than in previous years in the Midwest. 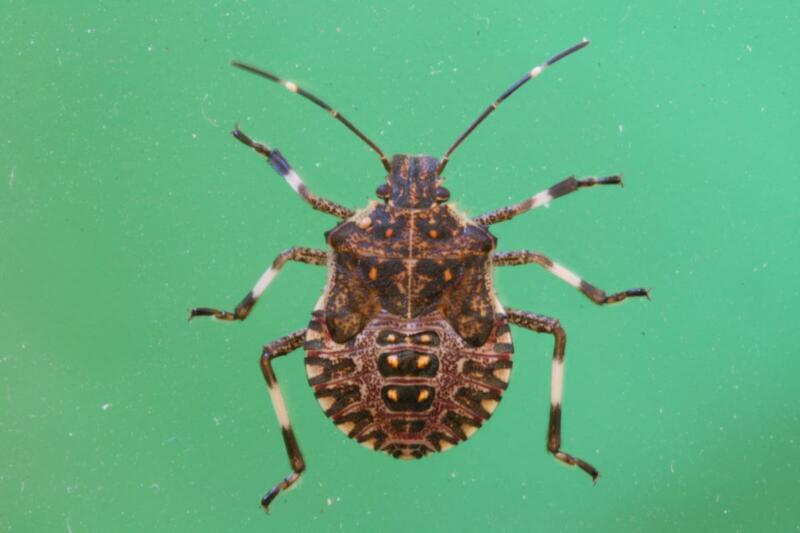 In Ohio, three stink bug species are commonly found: the green stink bug, the brown stink bug, and the spined soldier bug, the latter being a beneficial predator on small insect pests. In addition to these three stink bugs, we are also finding higher numbers of the red-shouldered stink bug on soybean (not to be confused with the red-banded stink bug, which is a growing problem in the deep southern United States), along with a relatively new invasive species of stink bug, the brown marmorated stink bug, on both soybean and corn (the latter especially being a potentially major concern on sweet corn). The brown marmorated stink bug was introduced into the country along the U.S. eastern shoreline and has made its way to Ohio. There is yet another introduced, closely related species that is now found on soybean in southeastern states known as the kudzu bug or globular stink bug. Kudzu bug is spreading its geographical range rapidly and it needs to be monitored. Fig 1. Adult green stink bug. Fig 2. Green stink bug nymph. Stink bugs are roughly shield-shaped insects as adults, and are usually about 1/2 inch in length, except for the adult green stink bug, which is slightly larger. They are called stink bugs because of the foul smell they produce to deter predators. Stink bugs have multiple generations in Ohio, and often can have multiple plant hosts during the summer. Stink bugs will overwinter as adults almost anywhere where they can be protected (including homes, in the case of the brown marmorated stink bug and kudzu bug), and begin feeding on various host plants as the temperatures rise. They will then begin their development and have 2–3 generations depending on the species and host plants. Their pest status depends on type and stage of the crop being attacked. On corn, the brown stink bug is the primary pest among stink bugs; it causes damage by feeding during early vegetative stages. The brown marmorated stink bug is known to feed on the corn ears. On soybean, most of the injury occurs during the second half of the growing season when significant feeding takes place on pods and developing seed. The green stink bug is the largest of stink bugs found in soybean (fig. 1). Adults are green with black bands on the antennae. There is a pointed spine on the lower side of its abdomen where the hind legs are attached to the body. Adult stink bugs will reach about 3/4 inch in size. Younger nymphs appear mostly blackish with some orange markings, and then turn green with dark spots down the center, usually with a dark-colored head (fig. 2). The brown stink bug, although also found on soybean, is more of a concern on young, developing corn (fig. 3). Adults are mottled brown with more rounded or just slightly pointed shoulders. They are around 1/2 inch in length. Adults do not have an abdominal spine between the hind legs. Younger nymphs are light brown in color, changing to a more green-brown to yellow-brown as they reach later instars (fig. 4). The brown stink bug occurs as a corn pest mainly in early summer during vegetative growth stages, where they will feed on young leaves, resulting in a series of identical holes across the leaf. Fig. 3. Adult brown stink bug. Fig. 4. Brown stink bug nymph. Fig. 5. Adult red shoulder stink bug. The red-shouldered stink bug is a relatively new pest found on soybean in Ohio (fig. 5). It resembles the red-banded stink bug, which is causing significant concern in southern states. The red-shouldered stink bug, while a concern, does not cause nearly the amount of injury that the red-banded can produce. Adults are green, usually with a red-pink stripe across the protonum, which is basically its "shoulder," although sometimes this stripe is not as evident. The adults may also have a pink marking on the tip of the triangle (scutellum). There is no spine on its abdomen between the hind legs. Nymphs are mostly white with dark red and black markings on the thorax and colored stripes on the abdomen. The brown marmorated stink bug is the newest stink bug found in Ohio field crops, and will perhaps become a greater concern in the future in soybean and corn, especially in sweet corn. Adults are speckled brown-gray with a white band on its antennae (fig. 6). There are dark and white bands around the edges of the abdomen, with the whitish markings appearing as triangles. Early nymphs have a dark head with an abdomen that is orange and red with black stripes down the middle. Later nymphs are brown with a white band on its antennae and strong white bands on its legs (fig. 7). The underside of the nymphs is characteristically white. Fig. 6. Adult brown marmorated stink bug. Fig. 7. Brown marmorated stink bug nymph. 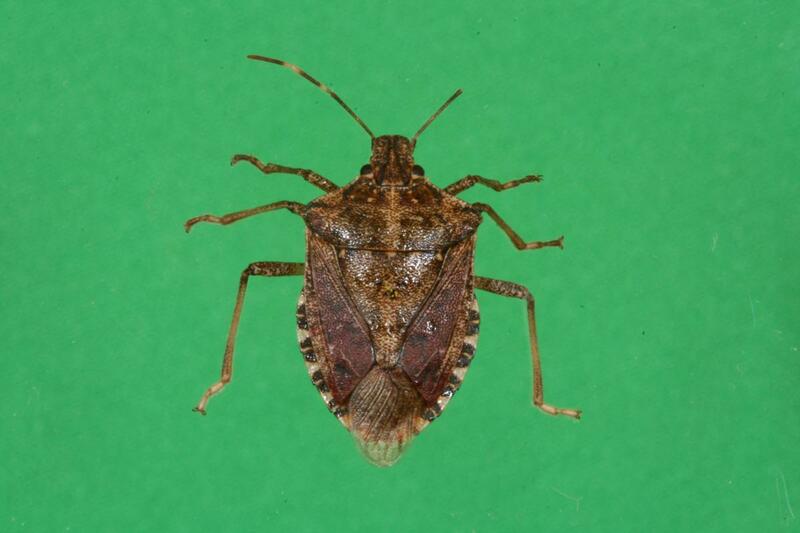 The spined soldier bug is a predaceous stink bug, feeding on numerous pests in all field crops (fig. 8). While it usually has pointed shoulders, its most characteristic feature is a long, pointed abdominal spine between its legs. Nymphs are a dark red with black heads, with later instars tan to orange with red and white stripes on the abdomen. The kudzu bug has become a major concern in soybean in the southeastern United States, although it is spreading quickly over a larger geographical area (fig. 9). While the true stink bugs (those described above) belong to the family Pentatomidae, kudzu bugs belong to the family Plataspidae, which are close relatives to stink bugs. While most of the injury from true stink bugs comes from their feeding on pods and seeds, kudzu bugs injure the plant by feeding on stems and petioles. This pest will need monitoring to determine if it starts to show up in Ohio. Fig. 8. Spined soldier beetle. Fig. 9. Adult kudzu bug. There are a number of other "bugs" that might be found in field crops that are similar in appearance to true stink bugs, including squash bugs (fig. 10) and assassin bugs (fig. 11). Most of these other bugs are more elongated or oval in shape, not the characteristic shield shaped of stink bugs. Some, such as the assassin bug, are predators that can inflict a painful bite. Fig. 10. Squash bug. Fig. 11. Assassin bug. Fig. 12. Stink bug injury on soybean. 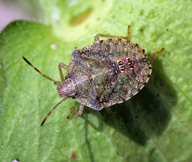 On soybean, stink bugs injure plants by puncturing tissues with their piercing and sucking mouthparts, and then extracting plant fluids. Although many parts of the plant can be fed upon, they prefer and mainly injure soybean by feeding on young, tender pods and developing seed. Darkish spots will occur where the mouthparts puncture the plant tissue, although these are difficult to see. The principal damage comes from loss of plant fluids, injection of digestive enzymes, deformation and abortion of seeds (fig. 12), and predisposition of the puncture sites to colonization by pathogenic organisms. All these factors can cause significant yield and quality loss. Often, stink bug feeding on soybean will result in delayed leaf maturity and foliage retention. During seed formation, seeds will become shriveled, deformed, undersized, and even be aborted. Feeding on more developed seeds will result in minor shriveling and discoloration. Often times not only will yield be affected, but stink bug damaged seed will result in lower market value and even prevent the sale of seed. This latter concern is especially important for seed producers and those growers producing food grade soybeans where quality is more of an issue. On corn, stink bugs are most often found feeding on young plants in late spring or early summer, with the brown stink bug usually being the one of most concern. Feeding at this time will result in holes in the leaf being present, and if severe, deformed plants. The brown marmorated stink bug will be found in later summer on corn usually feeding on the ear itself, directly destroying the kernels. This is especially a concern on sweet corn and can be quite damaging. Beginning in July when soybean reaches the flowering R2 stage, periodic sampling for determination of stink bug population abundance should be initiated. Sampling should intensify when pods are beginning to develop and seeds start to form. Scouting for stink bugs should be done by walking into the field at least 100 feet from the field's edge. There are two manners in which stink bugs can be sampled. In narrow row soybeans, the most common occurrence in Ohio, it is probably easier to use a sweep net. Sweep net sampling should be taken as sets of 10 sweeps at 3 to 5 locations in a field. Both adults and nymphs should be counted together; at this time, we do not have separate thresholds for the individual stages of stink bugs. Because the brown marmorated stink bug is often hard to sample with a sweep net, you might want to attempt to count the number of this species per ft row by searching carefully on the plants. In soybeans planted in 30 in. rows, you can either use a drop cloth placed between the rows, or else search the plants in a foot of row from numerous locations in the field. In corn, early growth should be scouted to determine if stink bugs, mainly the brown stink bug, is causing injury to young plants. For the marmorated stink bug, corn should be checked later in the summer for possible ear feeding, which should occur when checking for injury to the ear from other insect pests such as adult rootworms and Japanese beetle adults. The current thresholds on soybean for all stink bugs have been taken from neighboring states to our south and east where researchers have been contending with these pests for a much longer period of time. Because of the direct injury stink bugs cause to seed, thresholds are much lower than for many insects. When using a sweep net, insecticide treatments should be considered if an average of four or more adults or nymphs are collected per 10 sweeps in regular soybeans. If soybeans are being grown for seed or are food grade soybeans where quality is of more concern, we suggest lowering the threshold to only two adults or nymphs per sample. If counting the number of stink bugs per row, we usually use a threshold of two stink bugs per ft of row in regular soybeans, and only a single stink bug per ft of row for soybeans grown for seed or food grade usage. Most insecticides labeled for insect pests offer control of stink bugs; the list of insecticides is available on the Agronomic Crops Insects website (entomology.osu.edu/ag) for those insecticides labeled for stink bugs on both soybean and corn. This publication contains pesticide recommendations that are subject to change at any time. These recommendations are provided only as a guide. It is always the pesticide applicator's responsibility, by law, to read and follow all current label directions for the specific pesticide being used. Due to constantly changing labels and product registration, some of the recommendations given in this writing may no longer be legal by the time you read them. If any information in these recommendations disagrees with the label, the recommendation must be disregarded. No endorsement is intended for products mentioned, nor is criticism meant for products not mentioned. The authors, Ohio State University Extension, and the Ohio Agricultural Research and Development Center assume no liability resulting from the use of these recommendations. Additional information is available from your local Ohio State University Extension office or The Ohio State University Department of Entomology website (entomology.osu.edu).